As part of an effort to revive the moribund private-label securities (PLS) market, the US Treasury Department recently conducted an exercise with the major ratings agencies. This exercise was intended to boost investor confidence in the ratings process—a critical piece of the PLS system that failed during the housing crisis. The exercise revealed five important lessons we discuss in this brief. conflicts of interest in the issuer-paid model need addressing. The once-verdant private-label securities market collapsed at the height of the crisis and has remained a desert ever since (figure 1). In 2014, private-label securities issuance totaled $27.5 billion, a mere 10 percent of its volume in pre-bubble 2001. 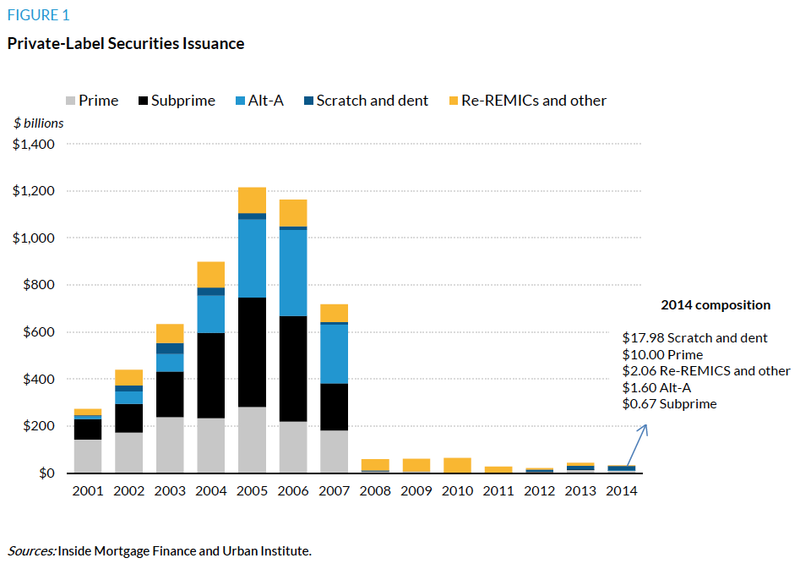 Of that meager share, only half involved new originations; the other half were securitizations of older loans. trustees, which enforce the terms of the contracts of all involved. These counterparties all failed investors in the crisis, leaving them with much riskier investments than they had realized, over which they had much less control than they had assumed. The mistrust coming out of this experience has led investors to demand near-perfect credit on pooled mortgage deals and greater returns on even the highest quality tranches. The credit characteristics of 2013–14 production have been remarkable, with an average FICO of 768, an average LTV of 67, and an average DTI of just under 31. Even for this pristine product, it makes more economic sense for a bank originator to hold these loans in portfolio than to place them into a PLS. As a result, there has been little PLS activity. 2013–14 mortgage pools credit characteristics (average): FICO 768, LTV 67, and DTI < 31. Industry participants and policymakers alike would like to see the return of a purely private market, albeit without the features that helped cause so much harm in the downturn. Yet the investors needed to make this happen remain resolutely on the sidelines. The challenge in bringing the PLS market back to life is formidable. It requires rebuilding investor trust in a system that failed them, yet there is no magic regulatory or legislative bullet: the parties simply have to develop terms of engagement that make each side willing to step back in. Over the past several months, the Treasury Department has used its considerable convening authority to begin such a process, bringing these parties together to discuss what it might take to re-enter the market. They have focused the discussions on the development of a benchmark transaction, in which terms are set that will inspire the confidence needed for other parties to come in behind it with additional transactions on similar terms. If the effort succeeds, issuers and investors will eventually do deals with a broader range of mortgages, and life will be breathed back into the PLS market. As part of this effort, the Treasury Department asked the six agencies that rate residential mortgage product (DBRS, Fitch, Kroll, Moody’s, Morningstar, and Standard and Poor’s) to analyze six hypothetical pools of residential mortgages and show loss expectations and subordination levels for each rating category, AAA through B. The base pool analyzed consisted of loans that collateralized Freddie Mac’s recent risk-sharing transaction, STACR 2014-DN3, with additional assumptions to more closely replicate an analogous non-agency execution. The intent of the exercise was to show PLS investors precisely how the rating agencies think about the risk associated with a range of pools, which in turn would allow these investors to better assess their own risk tolerance and investment appetite in the space. On Thursday Treasury released the results (link), showing the loss expectations and subordination levels for each rating category. Upon a quick review, we see five important lessons that should guide policymakers moving forward. Rating agencies are already factoring in recent improvements in the market. The rating agencies are clearly giving some credit to the strengthened regulatory environment, enhanced quality control processes, and greater standardization of data. Agencies have discounted the experience of loans made at the height of the process with similar characteristics, believing that these loans will behave moderately differently in the current regulatory environment. Larger loans with higher down payments receive strong ratings. New super-conforming loans (those over $417,000 but still within GSE limits) with 60–80 LTVs have rating cuts very similar to those on jumbo deals. This is a hopeful sign, as it suggests that investors with a relatively low risk tolerance should be increasingly comfortable moving into this space. Once the PLS market has worked out investor protection issues and expanded its investor base, imposing a surcharge on these super-conforming mortgages to encourage private capital in this area would make sense. It is important to address these frictions first, however, as lowering loan limits or raising the costs of guaranteeing these loans before addressing the frictions will simply increase the share of mortgages held on bank balance sheets, not revive the PLS market. Each of the agencies treats non-QM loans very conservatively, reflecting a view that they do not have sufficient information to assess the risk of these loans. As the market gathers information about the performance of non-QM loans and the litigation risk associated with violations of the ability-to-repay requirements, credit rating agencies will be able to refine their modeling. Until then, execution on this type of collateral is apt to be too expensive to be economic. Diversification should be embedded in the governance of any future, post-Fannie-and-Freddie regime. We have made this point several times before (see here and here), but it is borne out in the ratings. The cuts of new conforming collateral with 60–80 LTVs are very similar to those on jumbo deals despite a much wider range of loan characteristics. Though the characteristics are somewhat weaker than those on jumbo collateral in PLS (loans with a balance greater than the conforming limit in that geography, making them ineligible for GSE purchase), and the loss severities will be higher because the loans are smaller, greater diversification lowers the required enhancement to around the same level. Conflicts of interest in the issuer-paid model need addressing. The ratings diverge widely among rating agencies, giving rise to a significant conflict of interest when the issuer is able to choose among agencies. Given the choice, the issuer will presumably pick the rating agencies that are apt to be most positive on loans with those characteristics. Given the wide range of possible agency treatments, this variation gives issuers too much control over outcomes. One Dodd-Frank reform is a requirement that rating agencies not rating the deal have access to the same information as those rating it. The intention is that that those not chosen to rate the deal would issue adverse ratings (here’s how much additional subordination would be required to reach any given rating level, or here are the structural flaws in the deal). However, it is hard to see a rating agency producing such adverse ratings consistently if no one is paying for them. It is our hope that the rating agencies develop a subscription product, that they sell directly to investors, in which they examine each deal and provide strengths, weaknesses, and the amount of additional subordination required to achieve any given credit rating. With these lessons, and no doubt others to follow as we all dig into the findings, hopefully we are taking our first small steps out of the PLS desert. 1. Because of these additional assumptions, the subordination levels are not comparable to those that would be assigned to STACR 2014-DN3. As a result, this exercise has no implications for the existing GSE credit risk transfer transactions. Current is defined as current for the past three months. Jim Parrott is a senior fellow at the Urban Institute and owner of Falling Creek Advisors, which provides financial institutions with strategic advice on housing finance issues. He spent several years in the White House as a senior advisor at the National Economic Council, where he led the team of advisors charged with counseling President Obama and the cabinet on housing issues. He was on point for developing the Obama administration’s major housing policy positions; articulating and defending those positions with Congress, the press, and the public; and counseling White House leadership on related communications and legislative strategy. Parrott was previously a senior advisor to Secretary Shaun Donovan at the Department of Housing and Urban Development. He has a BA from the University of North Carolina, an MA from the University of Washington, and a JD from Columbia University School of Law. The Urban Institute’s Housing Finance Policy Center (HFPC) was launched with generous support at the leadership level from the Citi Foundation and John D. and Catherine T. MacArthur Foundation. Additional support was provided by The Ford Foundation and The Open Society Foundations. We are grateful to our funders, who make it possible for Urban to advance its mission. It is important to note that funders do not determine our research findings or the insights and recommendations of our experts. Copyright © February 2015. Urban Institute. Permission is granted for reproduction of this file, with attribution to the Urban Institute. The views expressed are those of the authors and should not be attributed to the Urban Institute, its trustees, or its funders.